Ruth Stewart-Verger’s presentation of ‘Bear and Lizzard’ an old folktale later rewritten as a picture book by George Shannon. Kitchissippi resident, Cambridge Public School teacher and storyteller, Ruth Stewart-Verger, grew up with stories told by her mother and grandmother. As Stewart-Verger’s mother, Donna Stewart recalls, everyone told stories back in the day. Both mother and daughter belong to Ottawa StoryTellers (OST), a not-for-profit organization that has been in existence for over 30 years. 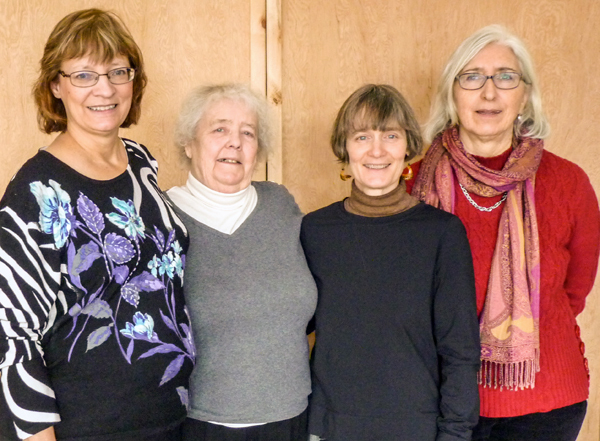 Both Donna Stewart and Niki diVito – a retired teacher – are among the original seven members who started Ottawa StoryTellers in the early 1980s. diVito grew up in Italy, in a place and time when school ended at 1 p.m. and her neighbour swapped stories while hanging up the wash. diVito has also taken courses from Dan Yashinsky in Toronto – a prolific author and teacher on the subject of storytelling. The OST began with seven members and now have over seventy. Their initial ‘story swap’ – open to tellers and listeners alike – continues to this day, as does their ‘Epic Tales’ – the telling of longer traditional stories. Many older folks may remember this series, which took place at Rasputin’s Café on Bronson Avenue. OST hosts storytelling sessions in schools, museums, festivals, arts days, in libraries, and on school PD days. They also used to teach teachers the art of storytelling. “The Board of Education went from being quite open to very closed,” explains Stewart-Verger. Now it’s the teachers who tell stories to the children. Ottawa StoryTellers Colette Laplante, Donna Stewart, Ruth Stewart-Verger and Niki diVito at Stories for Children & Families, at the West End Well in Hintonburg. Although Stewart-Verger likes to tell stories to children, the art of storytelling isn’t necessarily reserved for audiences of young people. When a storyteller or tellers engage their audience, age disappears. OST tales range from children’s stories, to literary adaptations, to classical texts, traditional tales and personal stories of transformation and discovery. Donna Stewart researches local history and makes up stories based on her research. One of the newer members of OST, Colette Laplante, uses the art of storytelling to enhance her work as a tour guide here in Ottawa. OST presents at over 100 events a year, and their annual festival attracts hundreds of people. OST hosts a myriad of storytelling workshops, seasonal events at Bytown Museum, and free storytelling sessions at the West End Well. For information about OST, go to ottawastorytellers.ca. Ruth Stewart-Verger’s website is at rasputins.ca/ruth.htm. Stories for Children & Families is a free program that takes place every third Sunday of the month from 1:30 p.m. to 2:30 p.m., at the West End Well (969 Wellington St. W.). Captivating tales told by Ruth Stewart-Verger, her mother, Donna Stewart, Colette Laplante, and Niki diVito will transport visitors to their childhoods. Special ‘guest tellers’ also present on a monthly basis. The next storytelling session is scheduled for Feb.15. You can find more information about it right here.